Kershaw quality in the kitchen? Yes, please! With the Kershaw 3pc Kitchen Knife Set 9920-3, that is exactly what you get. You receive a 3 inch paring knife, a 5 inch serrated utility knife, and a 6 inch fillet knife. The blades are made from durable AUS6A stainless steel for superior edge retention. The handles have a soft injection molded co-polymer construction that provides a comfortable gripping surface and helps ease hand fatigue. 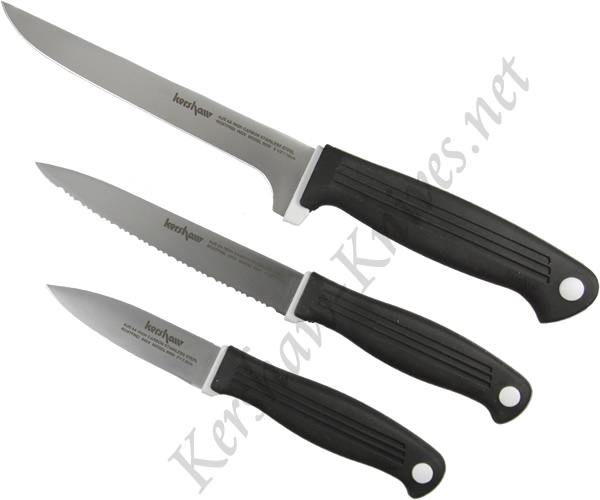 The Kershaw 3 pc Kitchen Knife Set 9920-3 is dishwasher safe and makes a great gift.